Thurs 1-8pm, Fri 1-9pm, Sat & Sun 7am-4pm!! But always check our times below before you come, particularly during the winter. If there are no divers or swimmers on site by the last check-in time, the staff will close early. from Thursday to Sunday and enjoy a relaxing swim! are so calming, your tensions will float away! it is the ultimate relaxation activity. That’s 4 days a week, including 2 days after work and after school!! by completing the online form further down this page. It’s easily the warmest lake in the region because of its depth, which retains the summer heat longer, compared to most local lakes which are much shallower, and lose their heat quickly e.g. 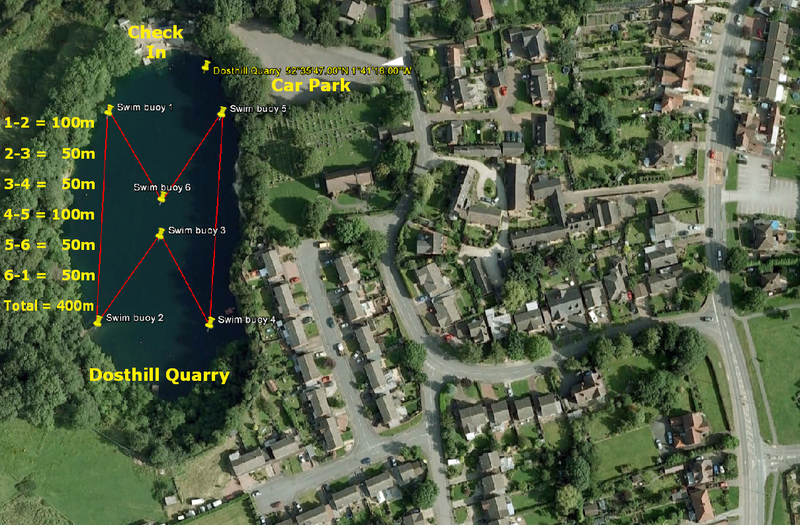 the shallow lakes dipped under 2 degrees last week when Dosthill Quarry was 7 degrees from the surface down to 30 feet. So the lake will be warmer than the region’s shallow lakes until around April next year. Dosthill Quarry has been owned and operated by Ian Forster for 30 years. You can call Ian 24/7 on 07928 562916 if you have any queries. You’ll enjoy the friendly family atmosphere that has made this incredibly attractive, and important, national swimming venue so popular. A former granite quarry flooded by a fresh water spring from 150 feet underground in 1934, the site is consistently recommended by swimmers for its clear, clean, pure, & healthy deep water. for tap water, you’ll be missing out if you swim anywhere else!! Unlike many shallow man-made lakes and former gravel pits that harbor freshwater snails, and parasites that infect swimmers, local residents and swimmers from many areas of the UK have enjoyed their sport free of the dreaded “swimmer’s itch” for more than 80 years. In fact, visiting swimmers who do have “the itch” often get better in this magnesium-rich, therapeutic spa lake. All abilities and ages are welcome, including costume-only and wetsuit swimmers (see our safety policy below). Whether you’re trying open water swimming for the first time, a child wanting to enjoy some splash time, or a member of our English Channel relay team you’ll get fitter and healthier at this amazing venue. Triathletes, in particular, can benefit from the variable rugged terrain of this 32 acre training centre by adding bike and run phases to their swim session. Or anyone just looking to get fitter, or lose weight, can benefit from the healthy outdoor environment. ASA Swimming Teacher, Middle Distance Coach and former British team member, Ian Forster, is available for training tips and schedules. We love helping our swimmers achieve their goals whether you do one 400m lap, a 40 lap/10000 metre swim, or a recreational swim around the lake, the clear water enables swimmers of any level to quickly improve their technique by being able to see the rotation and inclination of their hands during each stroke. The lake water is so much more pure than tap water, our Channel swimmers drink the water while they swim to stay hydrated!! Open 46 hours every week for you to get fitter, improve your swimming, and recover in our magnesium-packed ultra pure spring & spa lake..
All Year + 5 bank Holidays. Plan your swim to arrive within 3 hours of the closing time during the winter. If no swimmers or divers have checked in by this time the staff may well close early. If you intend to arrive late, or are running late, please call 01827 281304 or 07928 562916 to check if we will be open. Thursday 13:00-20:00. Last check-in at 6pm. Exit from the water by 7:30pm. Friday 13:00-21:00. Last check-in at 6pm. Exit from the water by 7:30pm. Saturday 07:00-16:00. Last check-in at 1:00pm. Exit from the water by 3:30pm. Sunday 07:00-16:00. Last check-in at 1:00pm. Exit from the water by 3:30pm. FREE online registration (below). £7 per swimmer per outdoor swimming session Thursday – Sunday. £1 tow float hire. £4 shortie wetsuit hire. £6 full wetsuit hire. Training schedules & coaching from £5 per 10 min session priced according to need and whether personal, group or video. Continue past the Church on your left, and turn left through green metal gates, into our site car park. 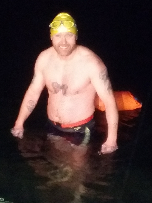 John Brain & Nick Balsdon are usually the first swimmers at Dosthill Quarry in the New Year at 7am when it is still dark! Note no suits in the positively tropical 8 degrees clear, clean spring-fed water. No algae, no swimmer’s itch, no freshwater snail parasites that bite. The first of many swims in an exciting new swimming year. Safety Policy. Whether you wear a costume only or a wetsuit, you are welcome. But to protect you in the deep water, you need adequate buoyancy. Wearing a wetsuit is the preferred way to prevent you sinking in the event of cramp (and keep you warm), and to increase your confidence if you are new to open water swimming. Many of our strong & confident swimmers tow a swim float summer & winter alike! If you don’t have a wet suit or tow float you can hire one for £1 tow float, £4 shortie wetsuit, £6 full wetsuit, or buy your own on site. Course. The above outdoor swimming course has been carefully planned and set out to provide a single 400 metre lap with integral 100 metre and 50 metre legs for split times. Four laps (1600 metres) is 5 metres short of a mile. 1000 metres would be 2.5 laps. The course has been positioned away from the quarry walls, particularly at the southern end of the lap (bottom of photo) where occasional loose rockfalls can occur, and away from the diver training areas where diver ascents are more frequent. Other than when avoiding a diver, please ensure you stay close to the outdoor swimming course buoys and on the course line. After you press the submit button you will receive confirmation that “Your registration for outdoor swimming was sent successfully to ian@dosthillquarry.com” and you will receive a confirmation email. I am aware that the use of a wetsuit is preferred at Dosthill Quarry to provide thermal protection and buoyancy. However, if I feel the weather, my exposure experience and my swim goals are such that I do not need a wetsuit, then I agree to swim towing a buoyancy float to support me in the event of experiencing cramp or other problem, until rescue assistance arrives. I fully understand and agree that the Dosthill Quarry centre through which I participate in the activity, nor the owner of Dosthill Quarry, Ian Forster, nor any of his respective employees, officers, agents or assigns, may be held liable or responsible in any fashion for any injury, death or damages to me or my family, heirs or assigns that may occur as a result of my participation in this open water swimming activity or as a result of active or passive negligence of any party including the released parties named in this document. In consideration for my participation in this activity I save and hold harmless and agree to indemnify the Dosthill Quarry centre at which I am participating in an open water swimming activity, and the owner of Dosthill Quarry, Ian Forster, of any claim or lawsuit brought by me, my family, my estate, my heirs or assigns arising out of or in connection or in conjunction with participation in this activity including both claims arising during or after the activity, and it is my express intention to release the parties cited from all liability and responsibility whatsoever for personal injury, property damage or wrongful death however caused. 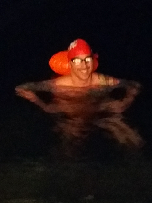 "Your registration for outdoor swimming was sent successfully to ian@dosthillquarry.com"